ALL CATEGORIES, ALL TYPES items with no search term. 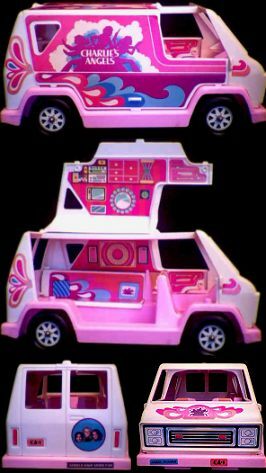 Charlie's Angels Adventure Van from 1978 made by Hasbro. There are no cracks or breaks, and all four tires are present in excellent condition. The toy has some minor stains on the plastic, and some of the stickers have curled edges, but overall this toy is still very displayable and in great shape. Why these babes can chase me down any time! Hubba-hubba! Change to limit displayed items. (c) 1999, The Pop Culture Store. Website design and hosting by Sohodojo Business Services. Item 56 of 466 items displayed in viewer. 0 items in cart.